Background: Colon epithelial cell (CEC) apoptosis and nuclear factor-κB (NF-κB) activation may compromise barrier function, and it has been reported that signal transducer and activator of transcription 5b (STAT5b)-deficient mice exhibit increased susceptibility to colitis. It is hypothesised that the growth hormone (GH) target STAT5b maintains mucosal barrier integrity by promoting CEC survival and inhibiting NF-κB activation. Methods: The GH effect upon mucosal injury due to 2,4,6-trinitro-benzenesulfonic acid (TNBS) administration was determined in STAT5b-deficient mice and wild-type (WT) controls. The effect of STAT5b deficiency upon CEC survival and NF-κB activation was determined and related to differences in intestinal permeability and bacterial translocation. RNA interference (RNAi) was used to knock down STAT5b expression in the T84 CEC line, and the effect upon basal and GH-dependent regulation of proapoptotic and inflammatory pathways induced by tumour necrosis factor α (TNFα) was determined. Results: GH suppression of mucosal inflammation in TNBS colitis was abrogated in STAT5b-deficient mice. STAT5b deficiency led to activation of a proapoptotic pattern of gene expression in the colon, and increased mucosal permeability. The frequency of apoptotic CECs was increased in STAT5b-deficient mice while tight junction protein abundance was reduced. This was associated with upregulation of CEC Toll-like receptor 2 expression and NF-κB activation. STAT5b knockdown in T84 CEC increased TNFα-dependent NF-κB and caspase-3 activation. GH inhibition of TNFα signalling was prevented by STAT5b knockdown. Conclusion: STAT5b maintains colonic barrier integrity by modulating CEC survival and NF-κB activation. STAT5b activation may therefore represent a novel therapeutic target in inflammatory bowel disease. Current evidence suggests that disruption of the intestinal epithelial barrier contributes to an exaggerated adaptive immune response to the enteric flora in Crohn’s disease (CD); however, the molecular basis for epithelial dysfunction is poorly defined. The signal transducers and activators of transcription (STATs) are a family of transcription factors which are activated by multiple extracellular cytokines and hormones to, in turn, regulate critical processes involved in metabolism, haematopoeisis and immunity. Targeted disruption of the STAT5b gene has demonstrated that it is required for growth hormone (GH)-dependent insulin-like growth factor-1 production and growth, and prolactin-dependent mammary gland function.1 We have reported that STAT5b activation is reduced in the affected colon in CD, and that STAT5b-deficient mice exhibit increased susceptibility to experimental colitis due to 2,4,6-trinitro-benzenesulfonic acid (TNBS) administration.2 This suggested that STAT5b was required for colonic barrier function. Intestinal epithelial cells (IECs), via highly regulated cellular turnover and tight junction protein (TJP) complexes, form a dynamic barrier against bacterial activation of the mucosal immune system.3 Inflammatory cytokines including interleukin 1 (IL1), tumour necrosis factor α (TNFα) and interferon γ (IFNγ) are thought to trigger IEC apoptosis in inflammatory bowel disease (IBD).4 Excessive IEC apoptosis may then compromise mucosal barrier function via a process termed the “apoptotic leak”, which increases paracellular permeability without affecting the TJP complex.5 6 While activated STAT5b through upregulation of Bcl-2 expression is known to promote extraintestinal cell survival,7 whether STAT5b is required for colon epithelial cell (CEC) survival and barrier function was not known. Multiple studies have suggested a central role for nuclear factor-κB (NF-κB) activation in the proinflammatory mucosal immune response in IBD. Our previous studies showed that STAT5b mediated mucosal immune tolerance in part through upregulation of the tolerigenic transcription factor peroxisome proliferator-activated receptor γ (PPARγ), which in turn inhibits NF-κB activation in IECs.2 However, a recent report has shown that STAT5b may also prevent NF-κB activation via direct protein–protein interaction.8 Toll-like receptors (TLRs) consist of a group of transmembrane pattern recognition receptors (PRRs) which play a critical role in microbial recognition, induction of antimicrobial genes and control of adaptive immune responses. Current evidence suggests that dysregulated TLR signalling in response to the enteric flora leads to NF-κB activation and sustained mucosal inflammation in IBD.9 Recent reports have also suggested that two members of this family, TLR2 and TLR4, are required for optimal epithelial barrier function and responses to acute mucosal injury.10–12 A role for STAT5b in regulating TLR signalling and thereby NF-κB activity in the gut has not been reported. We hypothesised that STAT5b would regulate mucosal barrier function through effects upon CEC survival and NF-κB activation. For the first time, we have found that STAT5b deficiency leads to increased apoptosis, upregulation of TLR2 and activation of NF-κB in CECs, resulting in disruption of mucosal barrier function. Antibodies specific for Bid, Bax, Bcl-2 and Bcl-xl were from Santa Cruz Biotechnology (Santa Cruz, California, USA). Antibodies specific for cleaved caspase-3, phospho-p65 NF-κB (Ser536), phospho-Stat1 (Tyr701) and phospho-Stat3 (Tyr705) were from Cell Signaling Technology (Danvers, Massachusetts, USA). Antibodies specific for ocludin, claudin, ZO-1, 2 and 3, STAT5a and STAT5b were from Zymed Laboratories (South San Francisco, California, USA). Antibodies specific for TLR2 and 4, DX5, CD4, CD25 as well as Foxp3 were from eBioscience (San Diego, California, USA). Antibodies specific for CD44, CD62L, CD11c and CD103 were from BD Pharmigen (San Jose, California, USA). ON-TARGET plus SMARTpool for human STAT5b was purchased from DHARMACON (Chicago, Illinois, USA). STAT5b-deficient mice were provided by Dr James Ihle, St Jude Children’s Research Hospital (Memphis, Tennessee, USA). The protocol was approved by the CHRF Institutional Animal Care & Use Committee. STAT5b ON-TARGETplus SMARTpool transfection was performed with pre-confluent T84 cells. AlamarBlue, fluorescein-conjugated control small interfering RNA (siRNA) and STAT5b western blot were used to assess cell viability and transfection efficiency. Cells were treated with recombinant human TNFα (10 ng/ml) for 16 h and GH (500 ng/ml) for 45 min. Microarray analysis was done in the CCMHC Digestive Health Center (DHC) Affymetrix core with mouse MOE-430 GeneChip array and Microarray Suite (MAS 5.0). Genes differentially expressed with a fold change difference of 1.3 and p<0.05 were then analysed for biological networks using the Ingenuity software application. The complete data set is available at the NCBI Gene Expression Omnibus (http://www.ncbi.nlm.nih.gov.proxy.libraries.uc.edu/geo/and GEO accession number is GSE8942). Briefly, isolated splenocytes and MLN cells were stained with CD4, CD25, Foxp3, CD44, CD62L, CD103, CD11c and DX5 (eBioscience). Mouse colon was everted and incubated in 1 mM EDTA to isolate CECs. CECs were stained with Pan-cytokeratin, Annexin V (BD Biosciences, Franklin Lakes, New Jersy, USA), cleaved caspase-3, phophoserine p65 (Cell Signaling) and pSTAT5 (eBioscience). The fluorescent signals were measured by flow cytometry (LSR II, BD Biosciences) through gating out cellular debris and intraepithelial lymphocytes. Data were analysed using FlowJo software. RIPA buffer was used for total protein (TP) extraction. Nuclear protein (NE) was prepared utilizing the NE-PER kit (Pierce, Rockford, Illinois, USA), and the postnuclear pellet was dissolved with SDS-dissolving buffer and kept as the membrane fraction (MP).2 21 The EMSA used to measure DNA-binding activity was carried out using a double-stranded oligonucleotide, as previously published.22 23 Briefly, the sequence of the double-stranded NF-κB oligonucleotide was as follows: sense, 5′-AGT TGA GGG GAC TTT CCC AGG C-3′; antisense, 3′-TCA ACT CCC CTG AAA GGG TCC G-5′ (the NF-κB DNA-binding consensus sequence is underlined; Invitrogen). A 50 μl aliquot of serum was used to measure cytokines and chemokines with LINCOplex (LINCO, Michigan, USA) and endotoxin ELISA (Cambrex, Maryland, USA). Results were presented as the mean (SEM). Data were analysed using analysis of variance followed by Fisher’s least significant difference test. p Values <0.05 were considered significant. 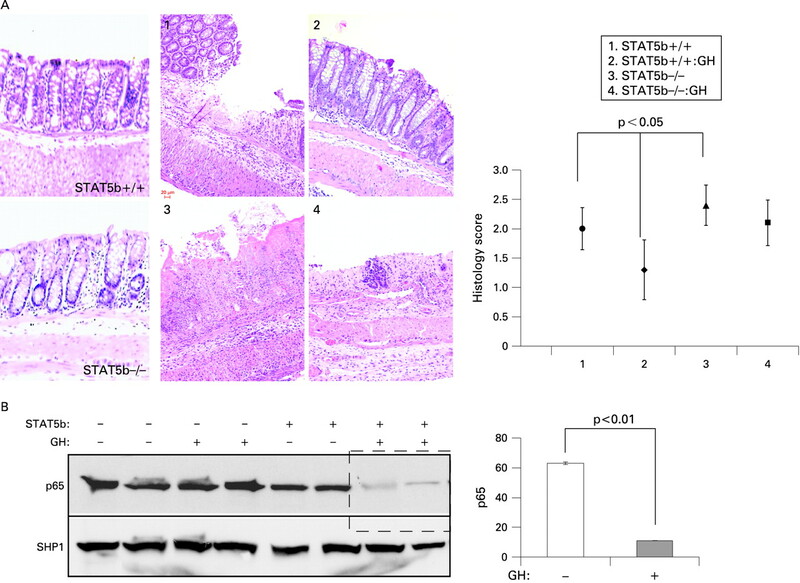 We have reported that GH can reduce the activity of experimental colitis due to IL10 deficiency, and that TNFα blockade induces an anti-inflammatory GH–STAT5b-dependent signalling pathway in this setting.14 24 There was no histological inflammation in the colonic mucosa of STAT5b-deficient mice under basal conditions.2 GH administration reduced the colitic activity induced by TNBS in WT mice, with the severity score in distal colon decreased from 1.96 (0.3) to 1.36 (0.5); this effect was completely blocked in STAT5b-deficient mice (fig 1A). Concomitant with the reduction in disease severity, NF-κB activity as measured by p65 nuclear abundance was reduced by GH in WT but not in STAT5b-deficient mice (fig 1B). 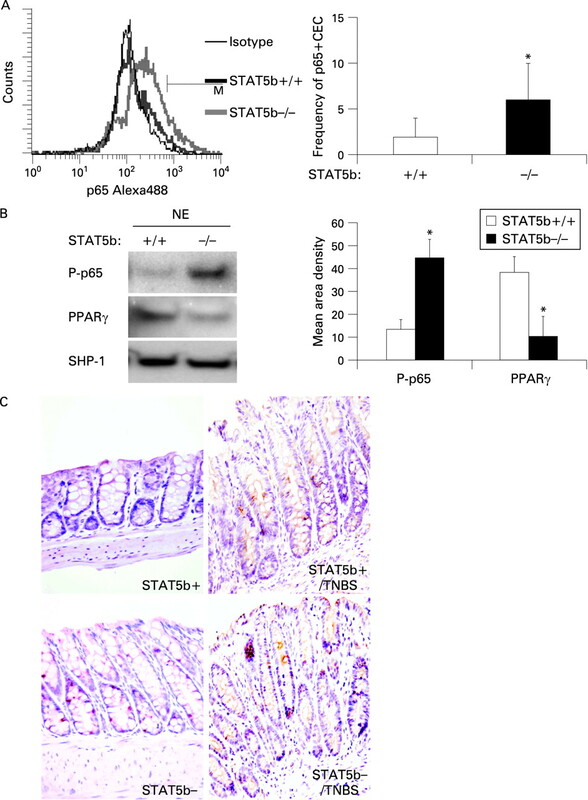 These data demonstrated that STAT5b is required for anti-inflammatory effects of GH in experimental colitis. We then asked whether STAT5b deficiency led to a primary defect in colon barrier function under basal conditions. Figure 1 Signal transducer and activator of transcription 5b (STAT5b) deficiency abrogates the effect of growth hormone (GH) upon nuclear factor-κB activation and mucosal inflammation in colitis due to 2,4,6-trinitro-benzenesulfonic acid (TNBS) administration. TNBS-treated wild-type (WT) and STAT5b-deficient mice received GH (3 μg/g twice daily) or phosphate-buffered saline for 2 weeks. (A) Representative images of WT and STAT5b-deficient mice at baseline, following TNBS, and following TNBS and GH, are shown. The mean (SEM) of the histological score for each group was as indicated, n = 7. (B) Colon nuclear proteins were prepared, and p65 and SHP1 abundance were determined by immunoblot. Signal intensity was determined by densitometry and is shown as the mean (SEM), n = 7. We found that paracellular permeability was significantly increased in STAT5b-deficient colon, from 5.59 (1.2) ng/min/cm2 in WT mice to 20.56 (3.7) ng/min/cm2 (p = 0.001) in STAT5b-deficient mice (fig 2A). Permeability to FD-4 was not significantly affected by STAT5b deficiency in ileum, suggesting a specific effect in colon. We tested the significance of this by measuring bacterial translocation to draining MLNs, and the level of endotoxin in peripheral blood. We found that bacterial translocation was significantly increased in STAT5b-deficient mice (fig 2A), and that serum endotoxin was increased from 0.18 (0.04) endotoxin unit (EU)/ml to 0.34 (0.1) EU/ml (n = 8, p<0.01). To confirm these results, we utilised intestinal mucosal strippings to measure TER, and paracellular and transcellular permeability. 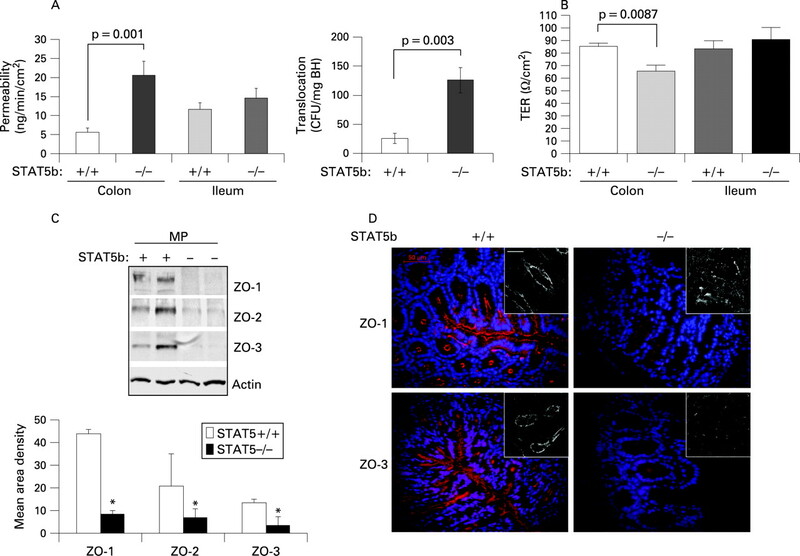 We found that TER in colon, but not ileum, is reduced by STAT5b deficiency (fig 2B), and confirmed increased paracelluar permeability (FITC–dextran) in the colon (Supplementary fig 1). Transcelluar permeability (HRP) did not differ between WT and STAT5b-deficient mice. Our PCR results showed that TJP mRNA expression (ZO1-3, occludin and claudin) did not differ between WT and STAT5b-deficient colon (Supplementary fig 2). However, the protein abundance in the cell membrane for ZO-1, 2 and 3 was reduced in STAT5b-deficient colon (fig 2C); this was confirmed by a patchy reduction in CEC expression of these proteins as shown by IF and confocal microscopy (fig 2D). Protein abundance for claudin and occludin did not differ between WT and STAT5b-deficient mice (data not shown). We then asked whether CEC survival would be reduced in STAT5b-deficient mice. Figure 2 Colonic barrier dysfunction in signal transducer and activator of transcription 5b (STAT5b)-deficient mice. (A) Ileal and colonic mucosal permeability to fluorescein isothiocyanate–dextran was determined in wild-type (WT) and STAT5b-deficient mice, n = 12. Bacterial translocation to mesenteric lymph node (MLN) was determined, n = 12. (B) Transepithelial resistance (TER) was determined by clamping the voltage across the epithelium layer mounted in Ussing chambers. Tight junction protein expression (C) and distribution (D) were measured with immunoblot, immunofluorescence and confocal microscopy (insets), n = 7. Results were expressed as the mean (SEM) and the original magnification was×400; bar = 50 μm. BH, Brain–Heart infusion; CFU, colony-foming units; MP, membrane protein. 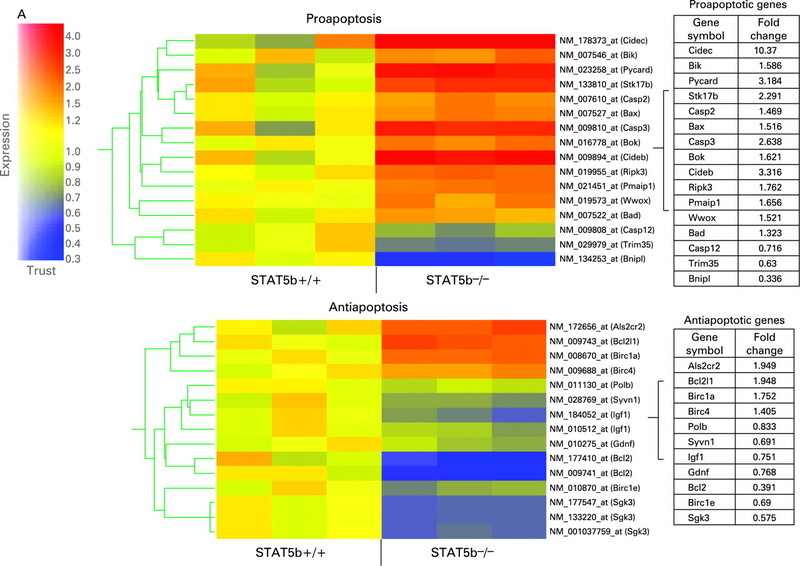 Microarray analysis demonstrated activation of a proapoptotic programme of gene expression in STAT5b-deficient colon (fig 3A). The Ingenuity software application was used to identify biological networks present within the set of colonic genes which were differentially expressed between STAT5b-deficient mice and WT controls. As shown in Supplementary fig 2, this included two networks whose primary function is to regulate cell survival. The primary nodes for these networks included upregulation of the pro-apoptotic Bax, caspase-3 (CASP3) and cytochrome c (CYCS) genes, and downregulation of the anti-apoptotic Bcl-2 gene. Of particular interest was upregulation of WW domain-containing oxidoreductase (WWOX), an essential mediator of TNFα-induced apoptosis, and downregulation of gelsolin (GSN), which protects cells from butyrate-induced apoptosis. In concomitance with microrarray analyis, STAT5b deficiency led to a significant upregulation of proapoptotic genes including those for Bax, Bad, Bik, Cideb and caspase-3, combined with downregulation of antiapoptotic genes including those for Bcl-2 and Birc1e. Immunoblots (IBs) confirmed that the protein expression of proapoptotic Bax, Bid, and total and cleaved caspase-3 was significantly upregulated in STAT5b-deficient colonic mucosa, while antiapoptotic Bcl-2 and Bcl-xl were reduced (fig 3B). Reflecting the imbalance between proapoptic and antiapoptotic proteins in STAT5b-deficient mucosa, the frequency of apoptotic CECs in surface and crypt epithelia was dramatically increased as demonstrated by TUNEL, and cleaved caspase-3 IHC and flow cytometry of isolated CECs (fig 3C,D). We observed no difference in the frequency of apoptotic lamina propria cells. Compared with significant apoptotic events of CECs, we did not observe a difference in CEC proliferation through PCNA and Ki67 immunostaining (data not shown). Therefore, it is most likely that the STAT5b pathway influences the process of CEC apoptosis instead of proliferation in colonic inflammation. We then asked whether these alterations in CEC survival would be associated with NF-κB activation. Microarray analysis showed that a number of genes involved in activation of NF-κB by the enteric flora were differentially expressed in the colon of STAT5b-deficient mice (fig 4A). These included upregulation of the cell surface PRRs TLR1 and TLR2, the TLR signalling molecule Myd88, and the NF-κB subunit Rel. Interestingly, TLR4, which mediates both proapoptotic and anti-inflammatory effects in the gut, was downregulated. IB performed using protein isolated from CECs confirmed upregulation of TLR2, and downregulation of TLR4, in this cell population in STAT5b-deficient mice (fig 4B). IB and IF staining confirmed increased TLR2 and decreased TLR4 abundance on primary CECs in STAT5b-deficient mice (fig 4A,B). Figure 4 Signal transducer and activator of transcription 5b (STAT5b) deficiency triggers upregulation of Toll-like receptor 2 (TLR2) and downregulation of TLR4 in colonic epithelial cells (CECs). (A) Microarray analysis was used to characterise expression of genes involved in activation of nuclear factor-κB differentially expressed (p<0.05 with ⩾1.3 fold change) in the colon of STAT5b-deficient mice (n = 3 each). (B) CECs were isolated, and immunoblot was used to determine the abundance of TLR2 and TLR4. Signal intensity was determined by densitometry and was expressed as the mean (SEM), n = 7. (C) Immunofluorescence (IF) was used to localise TLR2 and TLR4 expression in colon sections; the inset is the negative control. IF original magnification, ×400; bar = 50 μm. TP, total protein. In order to test the functional significance of upregulation of TLR2, Myd88 and Rel in STAT5b-deficient colon, we determined the abundance of the serine-phosphorylated p65 NF-κB subunit in isolated CECs by FACS and IB (fig 5A,B). Serine-phosphorylated p65 has been shown to be induced by TNFα.26 We found that the frequency of serine-phosphorylated p65-positive CECs was significantly increased in STAT5b-deficient mice (fig 5A). Consistent with this, the nuclear abundance of serine-phosphorylated p65 was also increased in STAT5b-deficient CECs, while PPARγ nuclear abundance was reduced as in our prior report (fig 5B). The frequency of CECs containing serine-phosphorylated p65 was increased in STAT5b-deficient mice compared with WT mice, both under basal conditions and following TNBS challenge (fig 5C). We did not observe a difference in the frequency of lamina propria mononuclear cells (LPMCs) containing serine-phosphorylated p65 between STAT5b-deficient mice and WT controls. With STAT5b depleted, the frequency of CECs containing tyrosine-phosphorylated STAT1 and STAT3 was also increased under basal conditions, without a difference in the LPMCs (Supplementary fig 4). Figure 5 Signal transducer and activator of transcription 5b (STAT5b) deficiency leads to the activation of nuclear factor-κB (NF-κB) in colon epithelial cells (CECs). (A) The frequency of serine-phosphorylated p65 in wild-type (WT) and STAT5b-deficient isolated CECs was measured by flow cytometry, n = 7. (B) Immunoblotting was used to determine the nuclear abundance of peroxisome proliferator-activated receptor γ (PPARγ) and serine-phosphorylated p65 in isolated CECs. Signal intensity was determined by densitometry and was expressed as the mean (SEM); p<0.05 vs WT and n = 7. (C) The frequency of phospho-p65 NF-κB- (Ser536) expressing cells was determined by immunohistochemistry, n = 7. NE, nuclear axtract; TNBS, 2,4,6-trinitro-benzenesulfonic acid. We then asked whether NF-κB activation in CECs would be associated with increased production of proinflammatory, NF-κB-dependent chemokines or cytokines in the circulation. Multiplex analysis confirmed upregulation of circulating monocyte chemotactic protein 1α (Mcp-1α; 69 (23) pg/ml vs 47 (16) pg/ml in WT, p = 0.05), Keratinocyte-derived chemokine (82 (31) pg/ml vs 49 (27) pg/ml in WT, p = 0.05), regulated on activation normal T cell expressed and secreted (Rantes; 6 (2) pg/ml vs 3 (1) pg/ml in WT, p = 0.01), IL1α (52 (14) pg/ml vs 31 (13) pg/ml in WT, p = 0.01), and granulocyte colony-stimulating factor (G-CSF; 491 (195) pg/ml vs 279 (181) pg/ml in WT, p = 0.04). By comparison, circulating TNFα, IL1β, IL6 and IFNγ did not differ between WT and STAT5b-deficient mice. Under these conditions, we observed no statistically significant differences in the frequency of CD44+CD62L− activated/memory T cells or CD25+Foxp3+ regulatory T cells, either in the spleen or in MLNs (see Supplementary fig 5A and B. However, we did identify a trend towards a reduction in the frequency of CD3−/DX5+ NK cells (Supplementary fig 5C). Taken together, these data demonstrated activation of a proinflammatory TLR2–NF-κB pathway in STAT5b-deficient colonic epithelia which may further contribute to dysregulated barrier function and susceptibility to colitis. We employed siRNA duplexes targeting STAT5b to knockdown gene expression by approximately 90% as measured by RT-PCR and IB of cell homogenates (fig 6C). 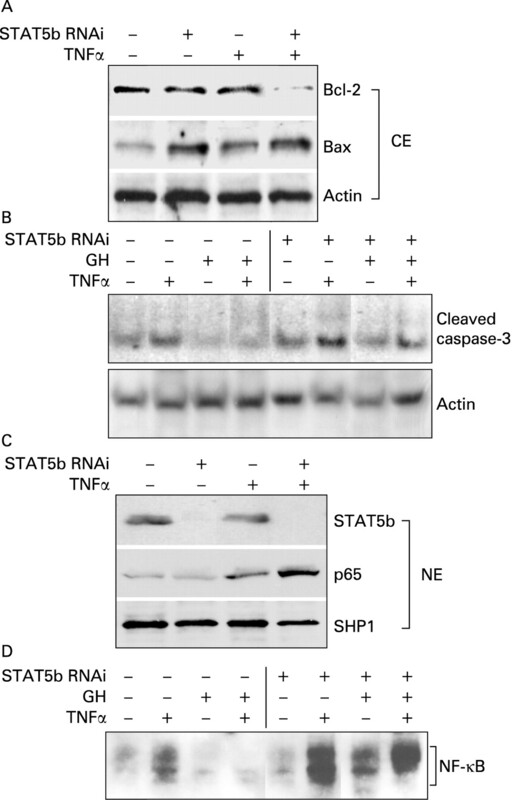 STAT5b knockdown enhanced TNFα-dependent upregulation of p65 nuclear abundance and NF-κB binding on EMSA, and promoted upregulation of the proapoptotic Bax protein, while leading to downregulation of the antiapoptotic Bcl-2 protein (fig 6A–D). Conversely, we found that GH inhibited TNFα activation of both NF-κB DNA binding and cleaved caspase-3; these effects were prevented by STAT5b knockdown. Taken together, these data confirmed that STAT5b regulates the susceptibility of CECs to TNFα-induced apoptosis and NF-κB activation, and suggested that the anti-inflammatory effects of GH in vivo would require STAT5b. Figure 6 Basal and growth hormone (GH)-dependent signal transducer and activator of transcription 5b (STAT5b) activation inhibits tumour necrosis factor α (TNFα)-dependent caspase-3 and nuclear factor-κB (NF-κB) activation in the T84 colon epithelial cell line. Subconfluent T84 cells were incubated with STAT5b ON-TARGETplus SMARTpool (STAT5b RNA interference (RNAi)) for 72 h and then treated with TNFα (10 ng/ml for 16 h) and/or human GH (500 ng/ml), and cytosolic (CE) and nuclear (NE) proteins were prepared. Immunoblots (A, B, C) or electrophoretic mobility shift assay (D) were performed as shown. Results representative of five independent experiments are shown. Properly regulated epithelial cell survival has emerged as a critical mechanism for maintaining mucosal barrier function. A role for STAT5b in IEC survival has not previously been proposed.27 Our global gene analysis identified activation of proapoptotic networks in the colon of STAT5b-deficient mice which led to a fivefold increase in the frequency of apoptotic CECs. TNFα is felt to be a primary mediator of CEC death and barrier dysfunction in IBD, as TNFα neutralisation increases CEC survival and reduces permeability. We found that, following STAT5b knockdown, the cellular Bax/Bcl-2 ratio and TNFα-dependent caspase-3 activation were substantially increased in the T84 colon epithelial cell line. It is therefore likely that STAT5b deficiency increases the susceptibility of CECs to TNFα-induced cell death, which in turn directly causes an increase in permeability. We employed complementary techniques to test for differences in barrier function between WT and STAT5b-deficient mice, and identified a selective increase in colonic transcellular permeability. Our previous publication showed that there are differences in the structure of the TJP complex between the ileum and colon, which include differential distribution and expression of TJP components including ZO-1, 2 and 3 as well as occludin phosphorylation and claudin.15 28 This may contribute to the differential effect of STAT5b deficiency upon permeability among different intestinal segments. In addition, the quantity and composition of the enteric flora vary between the ileum and colon, which may in turn interact with the observed alterations in TLR2/4 abundance to affect barrier function. While NF-κB exerts primarily a proinflammatory effect in the gut, recent studies utilising targeted deletion of components of the NF-κB activation pathway in IECs have highlighted unexpected roles in epithelial homeostasis and response to injury.29 30 TNBS administration led to a significant increase in CEC NF-κB in STAT5b-deficient mice compared with WT controls. The effects upon IEC survival are dependent upon the precise context in which NF-κB is activated. On the one hand, NF-κB blockade inhibits apoptosis during the resolution of inflammation in vivo.31 On the other hand, NEMO (NF-κB essential modulator) deficiency leading to reduced NF-κB activation sensitises IECs to TNFα-induced apoptosis.29 We found that STAT5b-deficient CECs have higher phosphoserine p65 and lower PPARγ nuclear abundance. As PPARγ has been shown to promote nuclear export of p65 in IECs, this probably contributes to ongoing NF-κB activation. Constitutive activation of NF-κB may then induce local release of proinflammatory factors including IL1α which contribute to ongoing CEC apoptosis, in the context of a primary imbalance in the cellular Bcl-2/Bax ratio. Further studies utilising transgenic mice deficient in both STAT5b and epithelial p65 will be required to determine the net effect of NF-κB activation in this context. However, it is important to note that our data suggest that STAT5b exerts a non-redundant effect upon CEC survival, which cannot be replaced by NF-κB activation. A prior report has indicated that STAT5b may also directly inhibit NF-κB signalling, by squelching limiting co-activators.8 We found that, following STAT5b knockdown, TNFα activation of NF-κB was enhanced in the T84 colon epithelial cell line. GH treatment prevented TNFα activation of NF-κB; this effect was prevented by STAT5b knockdown. GH has been shown to reduce the severity of colitis due to both TNBS or dextan sodium sulfate (DSS) administration and IL10 deficiency.24 32 To determine whether STAT5b might also inhibit NF-κB activity in vivo, we induced colitis in WT and STAT5b-deficient mice and treated them with GH to activate STAT5b. We found that GH treatment reduced NF-κB activation and histological disease severity in WT mice. The beneficial effect of GH was abrogated in STAT5b-deficient mice. 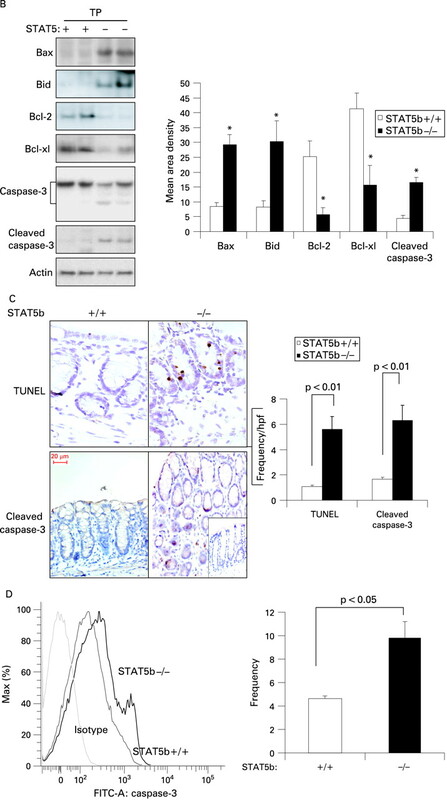 These data suggest that STAT5b is a critical negative regulator of NF-κB activation in CECs, and therefore contributes to maintenance of mucosal tolerance by limiting epithelial inflammatory responses. Bacterial components including lipopolysaccharide (LPS, via TLR4) and lipoteichoic acids (LTAs, via TLR2) can induce inflammatory or homeostatic responses in the gut.11 Under basal conditions, TLR2 is expressed at a higher level in the proximal colon, while TLR4 is expressed at a higher level in the distal colon.9 Although the expression of TLR2 is low in CECs, it can be upregulated by bacteria during acute infections.9 33 Upregulation of TLR2 in human IBD and in experimental colitis has been linked to increased NF-κB activation leading to chronic mucosal inflammation, while recent animal studies have also suggested a role for basal intestinal homeostasis.34 For example, TLR2-mediated tight junction assembly determines susceptibility to intestinal injury and inflammation.34 More importantly, suppression of TLR2 signalling in mice overexpressing NOD2 led to a protection from TNBS-induced colitis.12 TLR4 also mediates both proinflammatory and homeostatic responses to acute gut injury.10 11 TLR4 is required for the intestinal epithelial response to injury following DSS administration; furthermore, it was shown to limit bacterial translocation during colitis.35 36 However, TLR signalling via MyD88 is also essential for development of colitis in IL10-deficient mice,10 We found that TLR2 abundance was increased in STAT5b-deficient mice, in conjunction with upregulation of the TLR signalling molecule Myd88. Under these conditions, TLR4 expression was reduced. Therefore, the reciprocal increase in TLR2 and reduction in TLR4 mRNA expression with STAT5b deficiency may contribute directly to the constitutive NF-κB activation and susceptibility to TNBS colitis which we have observed. This will need to be formally tested in TLR2- and TLR4-deficient mice. Prior studies have demonstrated that deletion of STAT5b alone does not significantly affect systemic adaptive immunity. However, combined deletion of STAT5a and STAT5b reduces survival of regulatory T cells (Treg) and leads to autoimmunity including spontaneous colitis.37 38 In agreement with this, we did not detect significant differences in the frequency of splenic or MLN effector (CD44+CD62L−) or regulatory (CD4+CD25+Foxp3+) T cell populations in STAT5b-deficient mice under basal conditions (Supplementary fig 5). However, Cohen et al have reported that accumulation and regulatory function of CD4+CD25hi T cells are reduced in human STAT5b deficiency,39 and that STAT5b propagates an IL2-mediated signal which is required for the in vivo accumulation of functional Treg.40 Ongoing studies will determine whether alterations in Treg accumulation and/or function contribute to the increase in mucosal inflammation observed in the STAT5b-deficient mice with TNBS colitis. It is reported that natural killer (NK) cell-mediated proliferation was affected by STAT5b deficiency41; however, we did not test the significant alteration of NK cells in STAT5b-deficient mice. In summary, we have found that STAT5b is a critical molecular regulator of mucosal barrier function in the gut, via effects upon CEC survival, TLR expression and NF-κB activation. Studies using STAT5b bone marrow chimeras or epithelial-specific STAT5b-deficient mice will be required to test formally the effect of STAT5b deficiency in epithelial versus bone marrow-derived cells. It will be of interest to determine whether genetic polymorphisms affecting STAT5b abundance or activation contribute to susceptibility to IBD. Targeted activation of STAT5b with agents including GH may provide a useful therapeutic approach for restoring mucosal barrier function. Shila Gilbert and Erin Bonkowski provided outstanding technical assistance. The STAT5b-deficient mice were provided by Dr James Ihle (St Jude Children’s Research Hospital, Memphis, Tennessee, USA). This work was supported by the Crohns and Colitis Foundation of America and NIH grant R01 DK058259. Mouse colon sections for histological analysis were prepared in the Integrative Morphology Core, and microarray experiments were performed and analysed in the Microarray and Bioinformatics Cores of the National Institutes of Health (NIH)-supported Children’s Hospital Research Foundation Digestive Health Center (PHS Grant P30 DK0789392). .A mutant signal transducer and activator of transcription 5b, associated with growth hormone insensitivity and insulin-like growth factor-I deficiency, cannot function as a signal transducer or transcription factor. J Clin Endocrinol Metab 2006;91:1526–34. .Signal transducer and activator of transcription 5b promotes mucosal tolerance in pediatric Crohn’s disease and murine colitis. Am J Pathol 2006;169:1999–2013. .The tight junction protein ZO-1 establishes a link between the transmembrane protein occludin and the actin cytoskeleton. J Biol Chem 1998;273:29745–53. .Downregulation of epithelial apoptosis and barrier repair in active Crohn’s disease by tumour necrosis factor alpha antibody treatment. Gut 2004;53:1295–302. .Interleukin-13 is the key effector Th2 cytokine in ulcerative colitis that affects epithelial tight junctions, apoptosis, and cell restitution. Gastroenterology 2005;129:550–64. .Disrupted barrier function through epithelial cell apoptosis. Ann NY Acad Sci 2006;1072:288–99. .Constitutive activation of STAT5 and Bcl-xL overexpression can induce endogenous erythroid colony formation in human primary cells. Blood 2006;108:1551–4.
. Stat5b inhibits NFkappaB-mediated signaling. Mol Endocrinol 2000;14:114–23. .Toll-like receptors 2 and 4 are up-regulated during intestinal inflammation. Gastroenterology 2002;122:1987–2000.
. Role of toll-like receptors in spontaneous commensal-dependent colitis. Immunity 2006;25:319–29. .Recognition of commensal microflora by toll-like receptors is required for intestinal homeostasis. Cell 2004;118:229–41. .NOD2 transgenic mice exhibit enhanced MDP-mediated down-regulation of TLR2 responses and resistance to colitis induction. Gastroenterology 2007;133:1510–21. .Antibodies to interleukin 12 abrogate established experimental colitis in mice. J Exp Med 1995;182:1281–90. .Tumour necrosis factor alpha blockade induces an anti-inflammatory growth hormone signalling pathway in experimental colitis. Gut 2007;56:73–81. .Increased iNOS activity is essential for intestinal epithelial tight junction dysfunction in endotoxemic mice. Shock 2004;21:261–70. .Effect of mesenteric ischemia and reperfusion or hemorrhagic shock on intestinal mucosal permeability and ATP content in rats. Shock 1999;12:127–33. .IL-9- and mast cell-mediated intestinal permeability predisposes to oral antigen hypersensitivity. J Exp Med 2008;205:897–913. .Increased iNOS activity is essential for hepatic epithelial tight junction dysfunction in endotoxemic mice. Am J Physiol Gastrointest Liver Physiol 2004;286:G126–36.
. Isolation and functional characterization of human intestinal mucosal lymphoid cells. J Clin Invest 1977;59:966–74. .Flow cytometric analysis of Clostridium difficile adherence to human intestinal epithelial cells. J Med Microbiol 2001;50:526–34. .Increased iNOS activity is essential for pulmonary epithelial tight junction dysfunction in endotoxemic mice. Am J Physiol Lung Cell Mol Physiol 2004;286:L259–67. .CD14-mediated translocation of nuclear factor-kappa B induced by lipopolysaccharide does not require tyrosine kinase activity. J Biol Chem 1994;269:22253–60. .NAD+ ameliorates inflammation-induced epithelial barrier dysfunction in cultured enterocytes and mouse ileal mucosa. J Pharmacol Exp Ther 2003;307:443–9. .Growth hormone inhibits signal transducer and activator of transcription 3 activation and reduces disease activity in murine colitis. Gastroenterology 2005;129:185–203. .Effect of butyrate on paracellular permeability in rat distal colonic mucosa ex vivo. J Gastroenterol Hepatol 1999;14:873–9. .Tumor necrosis factor-alpha-induced IKK phosphorylation of NF-kappaB p65 on serine 536 is mediated through the TRAF2, TRAF5, and TAK1 signaling pathway. J Biol Chem 2003;278:36916–23. .Physical and functional interactions between Cas and c-Src induce tamoxifen resistance of breast cancer cells through pathways involving epidermal growth factor receptor and signal transducer and activator of transcription 5b. Cancer Res 2006;66:7007–15. .Claudin profiling in the mouse during postnatal intestinal development and along the gastrointestinal tract reveals complex expression patterns. Gene Expr Patterns 2006;6:581–8. .Epithelial NEMO links innate immunity to chronic intestinal inflammation. Nature 2007;446:557–61. .Loss of epithelial RelA results in deregulated intestinal proliferative/apoptotic homeostasis and susceptibility to inflammation. J Immunol 2008;180:2588–99. .Possible new role for NF-kappaB in the resolution of inflammation. Nat Med 2001;7:1291–7. .Enhanced survival and mucosal repair after dextran sodium sulfate-induced colitis in transgenic mice that overexpress growth hormone. Gastroenterology 2001;120:925–37. .Strategic compartmentalization of Toll-like receptor 4 in the mouse gut. J Immunol 2003;170:3977–85.
. Toll-like receptor 2 controls mucosal inflammation by regulating epithelial barrier function. Gastroenterology 2007;132:1359–74. .Toll-like receptor-4 is required for intestinal response to epithelial injury and limiting bacterial translocation in a murine model of acute colitis. Am J Physiol Gastrointest Liver Physiol 2005;288:G1055–65. .MyD88-deficient mice develop severe intestinal inflammation in dextran sodium sulfate colitis. J Gastroenterol 2005;40:16–23. .Essential role for STAT5 signaling in CD25+CD4+ regulatory T cell homeostasis and the maintenance of self-tolerance. J Immunol 2003;171:3435–41. .Loss of tolerance and autoimmunity affecting multiple organs in STAT5A/5B-deficient mice. J Immunol 2003;171:5042–50. .Cutting edge: decreased accumulation and regulatory function of CD4+ CD25(high) T cells in human STAT5b deficiency. J Immunol 2006;177:2770–4. .IL-2 receptor beta-dependent STAT5 activation is required for the development of Foxp3+ regulatory T cells. J Immunol 2007;178:280–90. .Stat5b is essential for natural killer cell-mediated proliferation and cytolytic activity. J Exp Med 1998;188:2067–74. Funding: Grant support was obtained from the Crohns and Colitis Foundation of America (XH) and NIH grant R01 DK058259 (LAD).